A little while ago I received an email out of the blue from a puzzling friend I’d ‘met’ on the inter-web. I say ‘met’, because apart from the odd puzzle being sent backwards or forwards, all of our interactions have been purely digital – and I wouldn’t recognise him if I bumped into him at a Puzzle Party, and yet his email was one of the most generous emails I’ve ever received. He’d just read my blog post about the DIY Chopstick Box and wanted to know if I might be interested in a couple of Stickmen in need of finishing off that he happened to have lying around. He had a pair of Try-Knots and a Grandfather Clock in need of a bit of TLC and he wanted to see them going to a good home. Given that I already had a Try-Knot, I sent a quick email to a couple of mates to check if they might be interested in a Try-Knot each and wasn’t all that surprised when they both jumped at the chance to take one, even if it involved a little bit of finishing on their part. That enabled me to reply to the kind offer and say that we’d take the lot of them and promised they’d all be going to good homes. A short while later I had a great email from the Stick-meister himself to say he’d heard that I was going to be getting some more DIY boxes, offered some useful advice and plenty of encouragement and ended off with yet another open-ended offer of any further advice or help I might need on the project. A short while later the rather large box arrived with a couple of Try-Knots and largely together Grandfather Clock with a bag of spare parts. That all happened just before MPP4 so Chris and Ali were able to pick up their Try-Knots at MPP4 ... since then Chris has brought his around and he’s done a great job on tidying up the frame and loosening up the travel – to the extent that it’s as good as my own Try-Knot, if not a little smoother on some bits – good job that man! 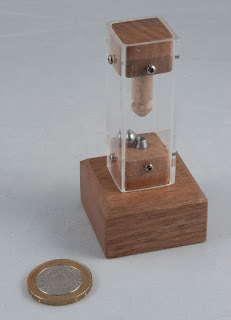 The Grandfather Clock was more or less fully assembled when it arrived although the front wasn’t glued in place, allowing me to get into the mechanism and fiddle around a bit – and there was a corner bit on one side that needed replacing. Everything else looked like it was in its place and the mechanism all seemed to work properly – albeit a bit a prone to jamming up a bit from time to time. First order of business was to have a good root around through the mechanism to make sure that everything was in place, well secured (well, the bits that should be anyway!) and that there weren’t any extraneous bits gumming up the works. 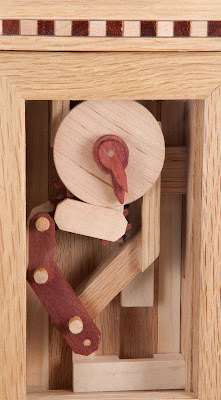 Most of the mechanism was more or less accessible – although getting to all of the gears took a bit of fishing around and reminded me of some of the more fiddly aspects of building model aircraft. Over the next week or so things started to jam up less and less and I’d also sanded down the glue on that corner bit, roughed up the insides and then glued it in place. With the mechanism now working fairly smoothly pretty much most of the time [Rob had mentioned that they all tended to bind once in a while and that was fairly normal] I turned my attention to finish-sanding the outsides of the box and giving it a bit of a tidy up (in fairness, it didn’t need very much at all!). Proceedings then moved out to the garage for a quick application of the thinnest coat of thinned satin lacquer possible, followed by wiping off any remaining traces about 10 minutes later. The next morning it was looking pretty good, and a bit of Renaissance Wax added quite a bit to the depth of the colours and brought out a bit more of the wood’s features. A bit more polishing and waxing over the next few evenings – especially around the bits-that-move left it all not only looking rather nice, but functioning quite well too. The final job was gluing on the front cover with the window and this turned out to be a bit tricky – so in the end I used some double-sided sticky pads to hold it in place so that if I ever need to get to the insides again, I’ll be able to encourage it open gently. Which brings us to this past weekend: I can now add a Stickman Grandfather Clock to my little collection of Stickmen. While I didn’t get to enjoy working out how to solve the puzzle myself, I did get a huge sense of satisfaction from getting it all to work a bit more smoothly before reassembling the final few bits – and it looks absolutely smashing! Rob’s attention to detail on this piece is staggering – the detailed inlay work around the crown is gorgeous and the way he’s created the illusion of a pair of doors down the bottom, complete with handles (just because he could) is phenomenal. This was also my first taste of Rob’s legendary wooden gears – the mechanism inside the clock is entirely wooden – there are levers and gears and cams all working together to drive either one of the hands, or both of them in opposite directions – the design is both elegant and clever, and he’s left most of it out in full view for your entertainment ... of course finding the means of driving all of that is quite a challenge as he’s hidden them around the box very neatly – when it’s all closed up, there is virtually no clue as to what might drive all the innards, let alone how you might actually control any of it. Helpfully you are told to set the time to midnight in order to unlock the puzzle, however once you've done that there are still a couple of rather well disguised steps to get through before you can finally open the drawer. 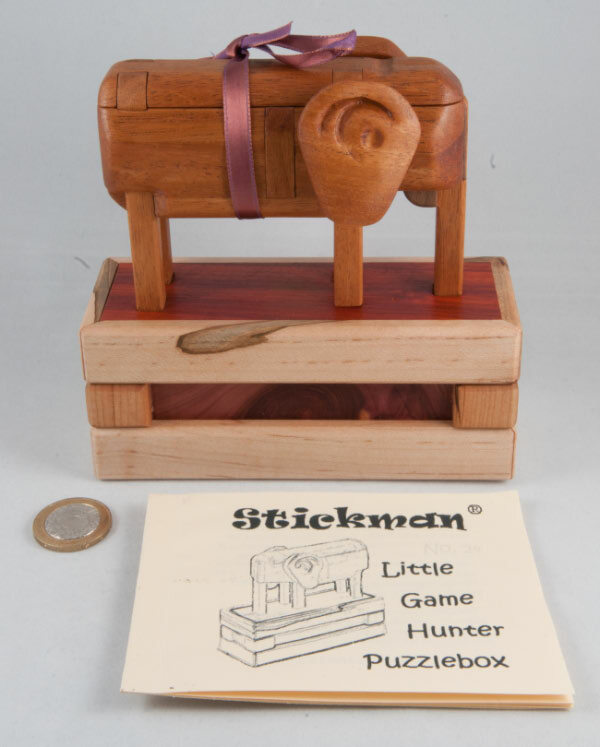 Stickman Puzzlebox #6 was originally sold in February 2005. A total of 28 copies were made and they don’t seem to pop up on the auction sites very often – which makes me think that the folks who have them really like them – and I can see why that might be the case! 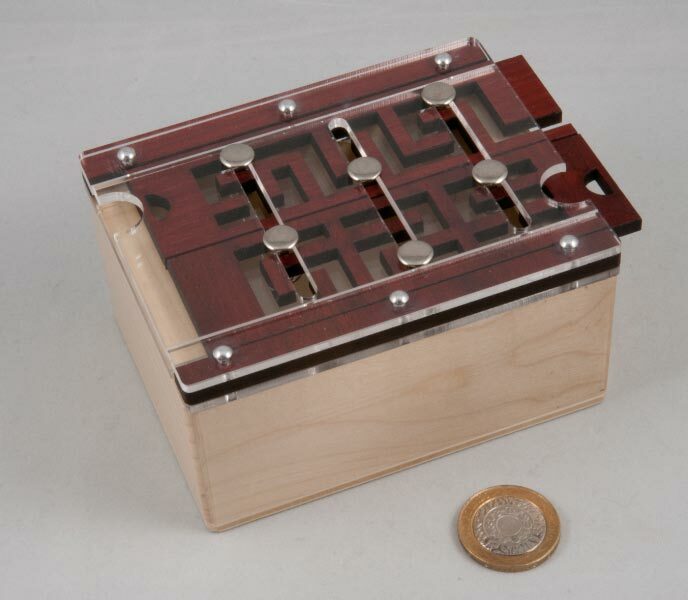 Laby Box is a nice-sized, possibly even useful-sized box with a locking lid comprised of two parallel maze keys with three interfering pairs of pins running in tracks perpendicular to the mazes – got that? You need to manoeuvre the maze keys out of the way in order to release the lid – but those pesky pins do a pretty good job of getting in the way! Handily Hendrik’s given you a couple of hints to get you started, like those two little holes on the ends of the maze strips to make it easier to pull them out from the starting position – unfortunately Hendrik’s also a crafty little sod, so near the beginning he sends you off in precisely the wrong direction. The maze strips themselves are delightfully simple designs, however the combination of having to get through two of them at the same time while navigating three pairs of joined pins makes for a neat little challenge. There are a couple of places where I found myself wondering how the heck I could go forward, and then needing to take myself back quite a bit in the process – sometimes not quite far enough and then ending up in a bit of a loop. Once you’ve released one of the mazes, the second can be slid out and the acrylic lid removed to give access to the box. I rather liked the Laby Box – it’s really nicely finished for a mass-market puzzle, the bits fit together very nicely and the puzzle offers a decent challenge, even if the simplicity of the maze keys might lead you to believe otherwise. If you’re interested in getting one for yourself, you could either try Wil, or get one directly from Hendrik Haak’s excellent web shop. 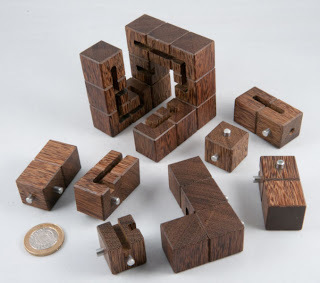 There’s a particular puzzle in Brian Young’s Opening Bat sequential discovery puzzle that is absolutely mind-blowing. I’d never come across anything quite like it before and the sense of achievement solving it produced was phenomenal. Now a large measure of the difficulty and the resultant sense of achievement come from the fact that the entire mechanism for that lock is hidden from view – you’re having to deduce what’s in there, how it works and how to defeat it. Brian recognised that this idea was an absolute gem and set about turning it into the guts of his own exchange puzzle for IPP31 in Berlin this year – and that’s where Houdini’s Torture Cell came from. Soon after Brian and Sue returned from their holidays (and a trip to IPP in Berlin) they listed a number of IPP puzzles that Brian had had a hand in creating at Mr Puzzle – it didn’t take long to spot and send off an order for a few interesting little items, and knowing what I did about the Opening Bat, I wasn’t going to pass up on getting a copy of Houdini’s Torture cell. 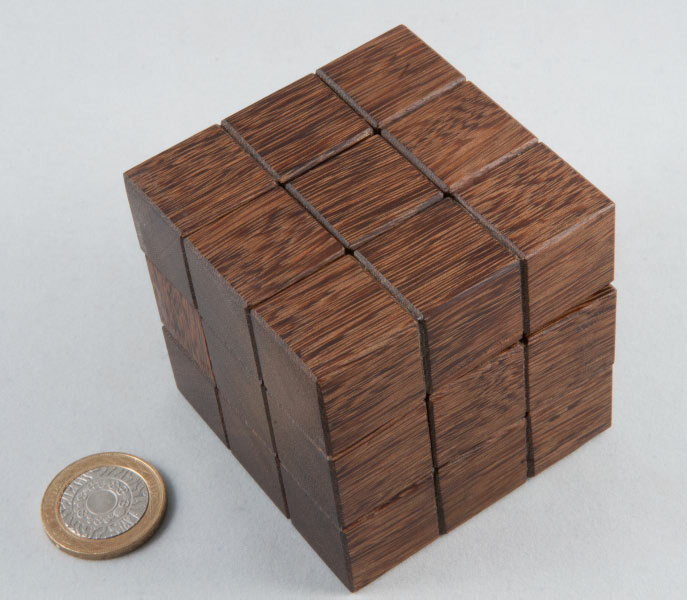 Brian bills this puzzle as a sequential discovery puzzle and it really is, albeit on a slightly less grand scale than his Opening Bat! There are several little discoveries along the way to keep you not only amused, but aware that you’re on the right path. He’s changed it a little bit from the version in the Opening Bat, and if anything made one of the earlier steps a little more difficult, but you can actually see what you’re doing here, so that’s only fair! It’s a great little puzzle that gives you something impossible when you start and something magical when you finish – it’s great to see that mechanism finding wider use – it really is simply too good to restrict to using it on only 50 copies of the Opening Bat. 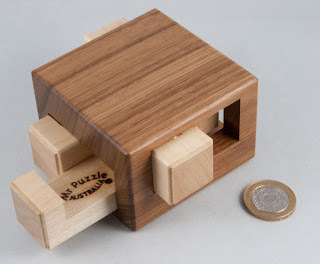 Vintage Mr Puzzle quality – looks great and works perfectly! 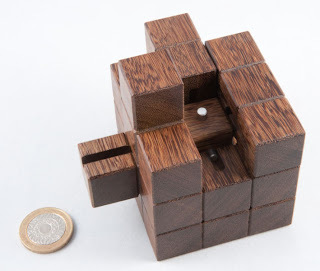 It’s easy to see why Brian received “very positive feedback” about this one at IPP and then has folks like Wil Strijbos announcing it was his favourite exchange puzzle this year – it’s great! Brian’s been making wooden versions of Pandora’s Box under licence from the designer’s (Tadao Muroi) son for a little while now, and even though I have a perfectly functional copy of the Eureka version (sold as Internal Combustion) made in aluminium, I really wanted a nice wooden version as well, so I splurged a little on a lovely Blackbean and Silver Ash version from Oz. It’s an unusual puzzle that has quite a number of different assemblies, ranging from the pretty simple to the 12-move assembly that it arrives in. That assembly has a number of amusing dead ends and while you’re running through the steps to release the first piece it’s pretty easy to see where Eureka got their name for this puzzle. With his usual attention to detail, the first piece to be released presents Brian’s trademark Mr Puzzle branding to the world on the way out – nice touch. 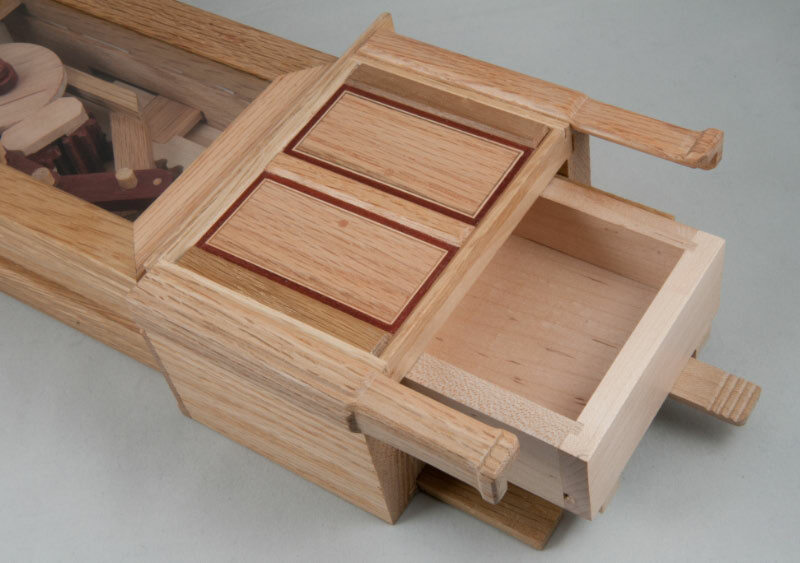 Beautifully made piece worthy of a place in Brian’s craftsman range. However, before I spotted anything on the auction sites, I was absolutely bowled over a couple of weeks ago when I received an email from Robert saying that he’d reserved a copy of the Little Game Hunter, aka Stickman #24 for me, if I’d like it. Like it? Heck yeah! The reply went back apologising for the fact that it had taken me nearly an hour to reply to the invitation, but in my defence, we’d been out for the afternoon. Hattie the Hephalump (I’ll explain!) was duly dispatched in days and tracked across the Atlantic courtesy of USPS Tracking – noting that she spent as long waiting to be processed for customs and tax charges on this side of the pond as she did making the entire rest of her journey! Once the ransom had duly been paid to HMRC, she was released safely to her new home in Barnt Green. Now everyone who’s ever had the privilege of owning a Stickman Puzzlebox knows they come with a neat little booklet that contains the owner’s certificate and series number as well as the solution to the puzzle. The Little Game Hunter booklets are a little different and they not only include the series number, but also the name that Robert has given each of his elephants – mine was christened Hattie, so she will be Hattie the Hephalump, from now on. This particular design goes back a little way and explains an unusual item in Jim Strayer’s Stickman Collection. 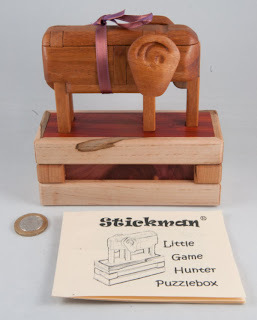 Jim has a complete collection of Stickman puzzle boxes (I tend to use his web site as my Stickman reference) and one of the items in there is unusual, in that it isn’t really a box – it’s a Kumiki elephant made by Robert. 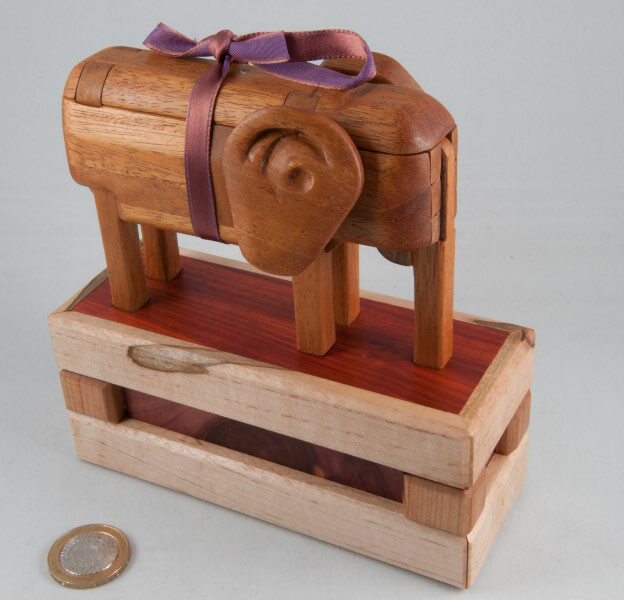 Jim’s description just notes that it’s a Kumiki elephant that comes apart into 19 pieces, but Robert’s email for the launch of the Little Game Hunter explains that this project was planned some time ago but had to be curtailed for reasons beyond his control that saw the elephants being cut off at the feet and being separated from their mounts and being sold off just as Kumiki puzzles. Little Game Hunter goes back to that design and completes it, mounting the elephant on top of a box (the missing elephment). Hattie arrived carefully packaged with her rather large ears neatly wrapped up between her legs – which is unusual because normally one would pack one’s trunk when travelling, not one’s ears, but there we are. She also had a neat little ribbon tied around her waist to stop the box’s second move from doing itself in the absence of the restraining piece, currently wrapped between her legs. First order of business is unwrap the ears and put them in place and then undo the ribbon – admire the puzzle for a while and then read the first page of the manual to get the background about the puzzle and Robert’s helpful warning not to feed her after midnight (shades of Gremlins?) – he also suggested that she is allergic to peanut butter (who’d have known?) and gets sunburnt really easily in a subsequent email – and there’s been a thread on Renegades that has rapidly deteriorated into a catalogue of all of my childhood elephant jokes in one place (although, in fairness, Robert’s not the only one to blame for that!) – he’s full of ‘em and you get the idea he’s been saving them up for a special occasion! Right – back to the puzzle then. First impressions: it’s tremendous! The Kumiki elephant and the box it stands on are entirely integrated – you need to solve them together to first take apart the elephant and then take the box apart – and when I say take them apart, I really mean that – when you’re done you literally end up with a pile of parts – quite an imposing sight if you’re having to reassemble your Hephalump! The first couple of moves are fairly straight forward with very little by way of options of what to do – but then at some point the box comes into it and things can get a little strange – especially when the interaction between the box and the Hephalump becomes central and there often appears to be more than one way to take things. After a while the Hephalump starts coming apart seriously and then it pretty much sheds all its bits leaving a (closed) box with a few things sticking out of it(!). 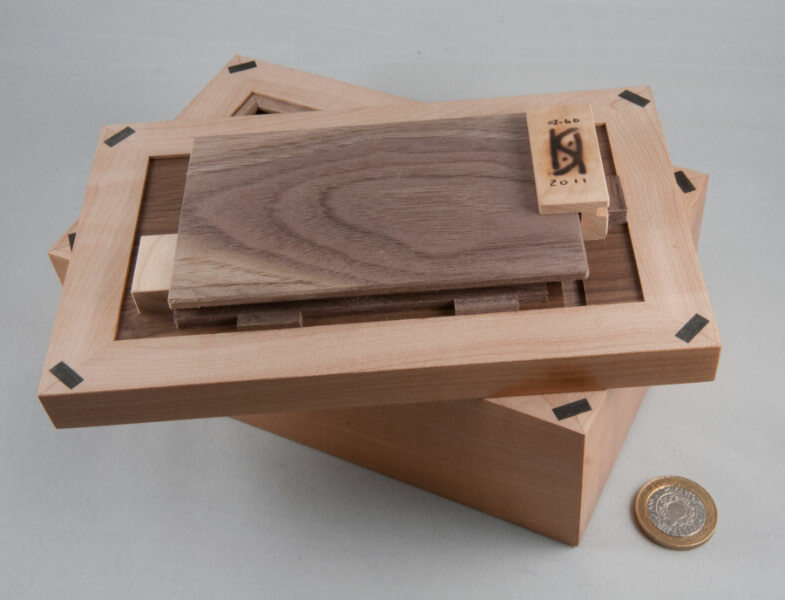 Puzzlingly, those bits appear to be getting in the way of opening the box – round two! From there it’s a fairly short process to get rid of the bits and collapse the base into a pile of pieces – leaving you with a total of 26 separate bits of wood – some vaguely recognisable as Hephalump bits. At this point it’s worth having a closer look at the wood that Robert’s chosen to use on this puzzle – because it reminds me of the reasons why I love wooden puzzles – the knots and features in the grain make it look absolutely unique and alive – your eye tells you there should be a ridge at the knots, yet the craftsman’s taken that totally out of the equation with a perfectly smooth finish. The fit of each of the pieces is perfect, yet the wood is still allowed to show off its own character – that’s the art of a true craftsman in my book – to get it to do exactly what you want it to do without sacrificing any of the original features that have been grown into that wood – and Rob does that beautifully. Since I managed to acquire mine, Rob’s sold another 6 on a Buy Out auction on Paradise ... if you do find one for sale, take it, you’ll like it, but please keep your Hephalump away from the peanut butter jar, especially after midnight! Thanks Rob, I love it! Thanks a stack to Matt for facilitating the US leg of the financial arrangements for us! Daedalus was one of three puzzles that Gregory Benedetti entered in this year’s Nob Yoshigahara Puzzle Design Contest at IPP31 in Berlin. His Ambigram Burr was one of the top ten vote winners that didn’t manage to win a prize and his S in Bloom looks like an interesting packing puzzle to pop on the Shapeways wish list, but Daedalus was the one that looked most interesting to me. 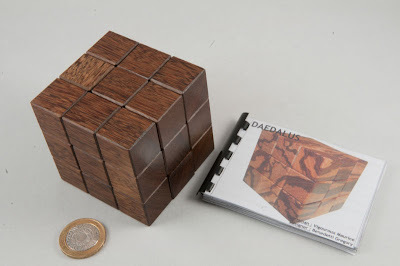 After the competition, the entry for the Daedalus was updated to mention that about 10 copies were available in marblewood and that about 20 further copies would be available from Gregory in other assorted hardwoods. 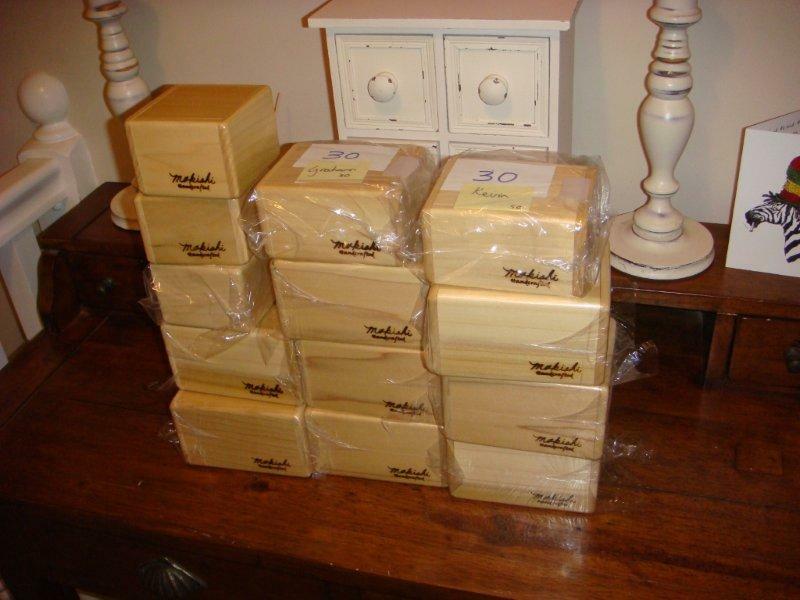 One of my puzzling mates, Chris, had been in touch with Gregory and lined one up for himself and mentioned it to me as Gregory was about to ship one to Chris and the rest to John Devost to sell on Puzzle Paradise. With a little help from Chris, I managed to snaffle one for myself in the process and he duly brought it around at MPP4 for me – thanks mate! The marblewood versions all got taken pretty quickly, so I had a selection of hardwoods to choose from, some of which I’d never heard of before – a little time on Google and glancing through the Hobbit House had me settling on a Wakapu cube – and rather handsome (and heavy!) it is too. The cube comes with a 52-page booklet, most of which is devoted to a series of wire-frame drawings showing the disassembly / assembly process. 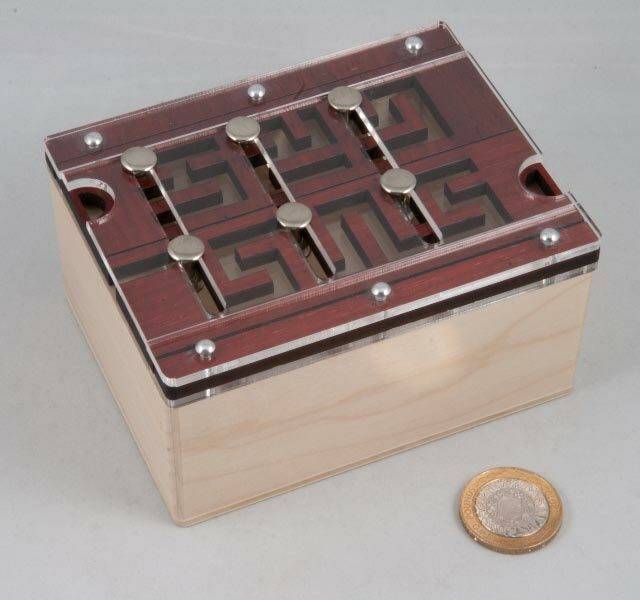 It also happens to note that the puzzle was made by Maurice Vigouroux – a rather sought-after craftsman – BONUS! In its fully closed form, the puzzle hides all of its secrets rather well – there is literally no clue to the sheer pandemonium hiding inside in wait for an unwary puzzler. One of the pics on the Contest website shows the Daedalus with a single piece removed – and it has teeth! From that picture you can surmise that the pieces are constrained by a series of pins and channels, but even that doesn’t really prepare you for the challenge. Now in the past I’ve been caught out by Gregory’s Youtube channel name “Rotations Required” not in fact coming into play [on Stand Py Me] – however this time he’d given plenty of warning on the puzzle forums that Daedalus required rotations – plenty of them – ah well, sayonara Burr Tools on this one. The day after MPP4 I had a pretty good go at solving Daedalus and ended up spending an hour and a half on getting it apart – now just to remind you, this is effectively a 3*3*3 cube that breaks down into 8 pieces – but those pins and those channels seriously manage to get in the way of taking this thing apart – and in fact putting it back together. From the very beginning there are a couple of things you can do to enable the cube to grow arms and legs, albeit in rather strange directions! Having given yourself some space, you can then start manipulating things around and about – and plenty of this involves rotating things in various directions ... and while you’re in there, you’ll discover that there’s a lot that you can do that isn’t in any way helpful as Gregory has rather kindly given you several blind alleys to explore in there! It must have taken the best part of an hour to release the very first piece, a single little block, albeit one with teeth! Progressing toward the next piece seemed to take me backwards for a while and it remains a non-trivial disassembly until virtually the last few pieces are ready to come out. I’m way too much of a wimp to try and reassemble this brute without the instructions, although my mate Chris isn’t, and has – but he’s much better at these things than I am! Reassembly, even with the (disassembly) instructions is tricky because you need to work out which pieces are going where and the drawings don’t always make that clear unless you flick backwards and forwards a bit ... and now, having done it a few times, I’m getting used to the high level stages involved, but I still find it catches me out, like the third or fourth move from the end it’s just far too tempting to bang one of the pieces all the way home, effectively blocking one of the remaining pieces from being closed up properly ... this is a great puzzle. I like it. I like it a lot! 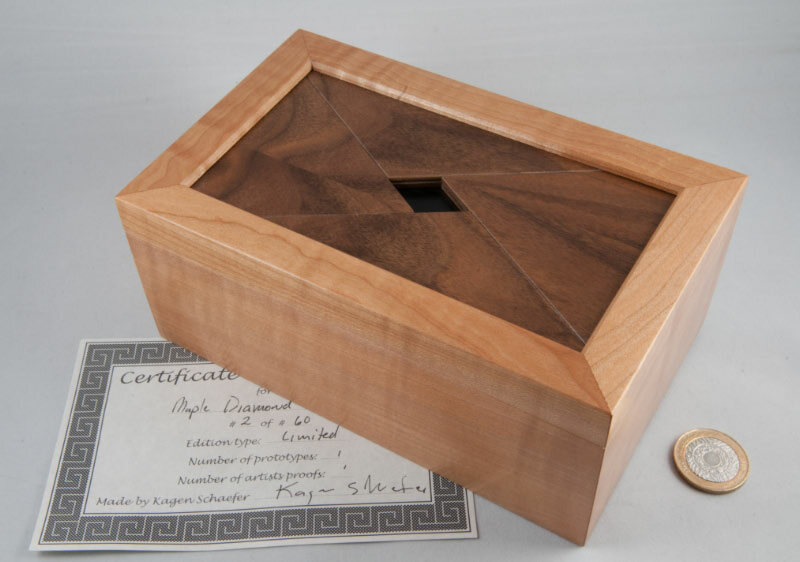 Kagen Shaefer has been known in the puzzling community for quite a while as someone who creates puzzles with the most incredible finishes. 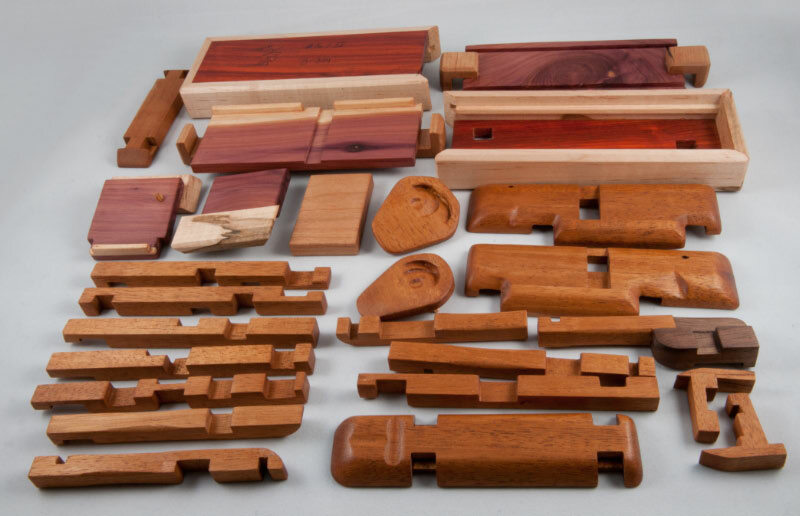 A quick glance through his website brings up some gorgeous puzzle boxes going back a few years as well as a few rather puzzling bits of furniture more recently – including an absolutely epic desk that will only release its secrets when the right tune is played on the drawers along the top (the desk conceals an all-wooden pipe organ and a programmable (!) 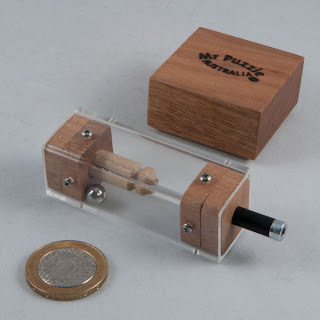 pneumatic logic board that tests the notes). 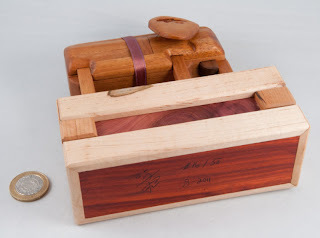 Earlier this year Kagen’s website announced that he’d be making a run of Diamond Boxes and after seeing a special version sold on the Puzzle Paradise Australian Relief auction earlier this year, I joined the queue for one. 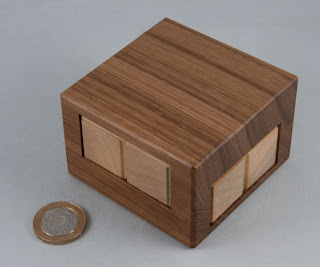 Two versions were going to be made and I opted for the budget version in Maple, foregoing the Lignum Vitae option. A few months later the rather well packaged little beauty arrived in Barnt Green, whereupon Gill promptly intercepted it and hid it for two days until my birthday, making for a great surprise as I hadn’t realised it had arrived. First impressions are that this is a really solid box and the finish is every bit as impressive as you might expect from Kagen’s reputation. 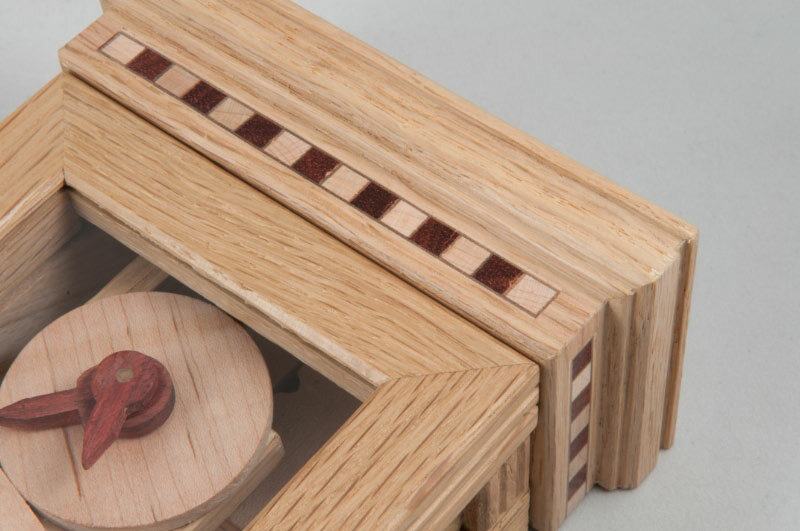 Kagen describes the finish as one popular with makers of fine musical instruments and from the feel and sheen on the wood it’s hard to disagree. It really catches the light beautifully and seems alive – especially that curly maple on the base of the box. 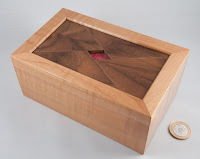 The main feature of the box is the set of four triangular walnut plates on the top that frame a black diamond in the centre when it’s locked. A little manipulation magically changes the colour of the diamond from black to pink – even after you’ve done this a hundred times, it still looks magical. Kagen’s got the timing and the tolerances absolutely perfect on that switch from the Gabon Ebony across to the Pink Ivory wooden plate. 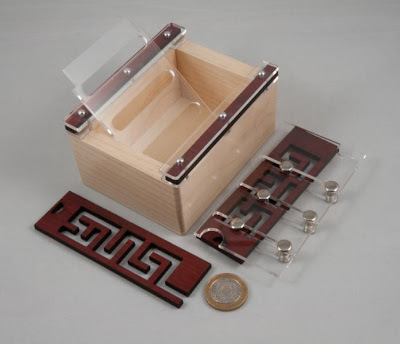 Once unlocked, the box opens in a fairly traditional manner revealing a pretty generous interior. All of the mechanics are neatly hidden away inside the beautifully finished lid that looks remarkably thin given the mechanics it hides. It’s all beautifully finished, even on the inside – with ebony slip feathers strengthening each of the corners. Kagen’s trademark branding, numbering and dating make a neat little feature of an integral part of the mechanism on the lid – neat touch.